To Launch - At the water’s edge set Latch to ‘Retrieve’ position. 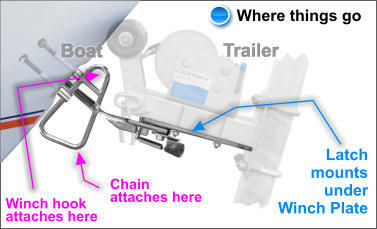 Release safety chain and release winch cable, so the boat can roll/slide back and be caught by the latch. Set the latch lever to the 'Launch' (Port) position. The boat and trailer are reversed into the water to a depth where the boat MUST be UNABLE to float off the trailer. Rear rollers/slides are about 50mm (2”) below water. Start the boat motor and ease forward. The spring loaded catch will automatically release. Reverse or glide off the trailer. More detail is available on the Launch & Retrieve operation in the Box Insert Brochure that comes with the product.. ‘Using Your L & R Boat Latch’ This covers tips on how to use the product effectively. This is a 6 page brochure, that is included in the box, covering the use of the product and all the various options.